A serious downside of any DIY work - either domestic or professional - is the heavy-duty grime that gets everywhere. It gets stuck on your hands, under your fingernails, and generally anywhere else it can attach itself to, including tools and surfaces. BIG WIPES are the solution. Even if your job is taking place in a comfy house with running water, soap and plenty of nearby shops for those sudden cleaning supply needs, removing the nastier paints, oils and adhesives is often a big ask. Thankfully, BIG WIPES are here to provide you with a portable solution that very effectively tackles such problems, wherever the job and whatever its nature. With a "one wipe shifts the lot" ethos, BIG WIPES make light work of everything from paints (oil and water based, as well as hammer finish) and glues to silicone, acrylic sealants, epoxy fillers, grouts, oil, tar, inks and an impressive array of other grimy substances. 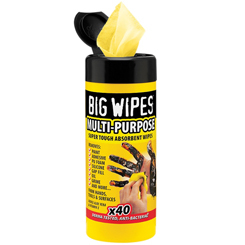 Also boasting a wide range of moisturising hand creams and sprays, BIG WIPES have you covered for any job, and their convenience is second to none: simply throw them into your tool box and get going. You'll wonder why you ever went without these very useful and well-designed products.